Nate Bremer, the owner of Solaris Farms, is a hybridizer specializing in northern-hard daylilies and peonies. 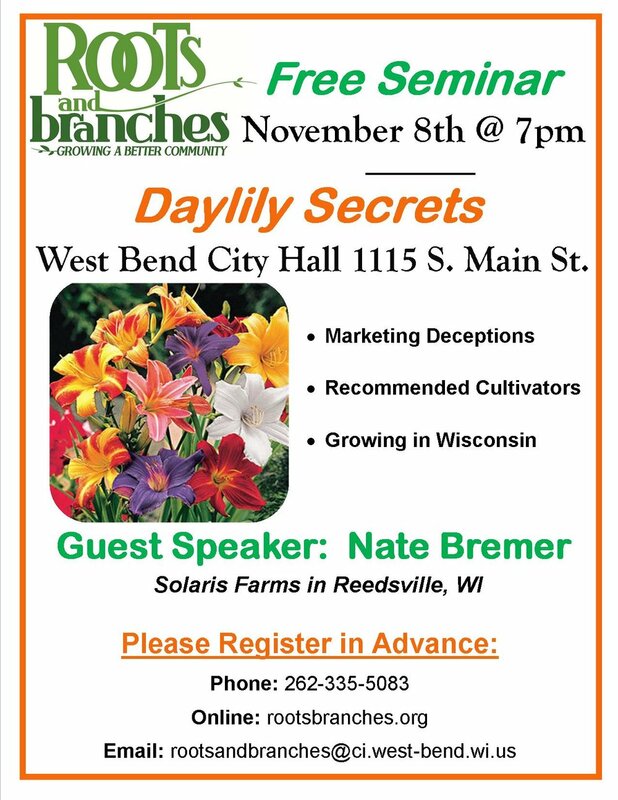 During the presentation he will be exploring marketing deceptions, recommended cultivators and growing daylilies in Wisconsin. Solaris Farms is home to more than 2,000 registered daylilies and a test garden of 10,000+ seedlings and new cultivators under propagation. The farm has been featured in numerous TV and magazine profiles and is a frequent destination of master gardener groups, clubs & specialists. The century old farmstead, located near Reedsville, WI is an official American Hemerocallis Society (AHS) Display Garden. Join us for “Daylily Secrets - 7:00 p.m. on Thursday, November 8th at West Bend City Hall 1115 S. Main Street. Register for this free, public event by calling 262-335-5083, emailing rootsandbranches@ci.west-bend.wi.us or online at rootsbranches.org. Older PostIf you Missed "Making Complete Use of Your Herb Garden"